Inflammatory bowel disease or “IBD” is a term that is used to describe a wide array of disorders that result in inflammation of the intestines. Medical professionals believe that this occurs because of an immune based reaction of the body. Instead of the body seeing the intestinal tissue as a normal part of its makeup, it starts to view it as a threat. When this occurs, it starts to attack the intestinal tissue. An estimated six hundred thousand individuals that reside in the United States are said to experience complications associated with inflammatory bowel disease annually. Throughout this gastrointestinal health guide, you will learn many important facts pertaining to inflammatory bowel disease. 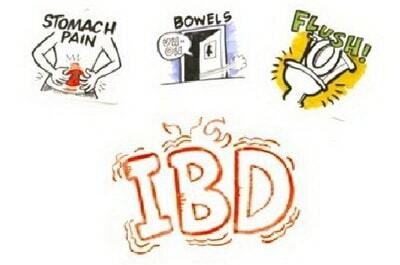 There are many common symptoms associated with inflammatory bowel disease. Since this type of disease actually consists of several different disorders, the symptoms that are experienced by a sufferer will be heavily dependent upon the type of disorder that the individual is suffering from. • Most individuals experience mild, moderate and even severe cramps in the stomach region of the body. • For many, the condition becomes so severe that they start to lose weight. The weight loss could occur for a couple of different reasons. For many, it occurs as a result of gastrointestinal complications such as diarrhea and vomiting. For others, weight loss comes because of the fact that the individual has had a loss of appetite. • Many individuals experience gastrointestinal complications such as vomiting, acid reflux, diarrhea and constipation. • It is not at all uncommon for a patient with inflammatory bowel disease to discover blood in their stools. • Many sufferers may feel as if they need to have a bowel movement, but when they are, they are unable to complete the movement successfully. This is referred to by medical professionals as “Tenesmus”. • Pain in the joints of the body is extremely common among sufferers. • Many individuals find that they experience high levels of fatigue when they suffer from this type of issue. Despite the fact that the person has rested, they may still feel extremely tired. There are many different theories associated with the causes of inflammatory bowel disease. Unfortunately, none of the theories on the causes of the condition have been proven by medical professionals. To date, no concrete cause has been linked to the conditions that are described as being IBD. However, medical professionals do feel as if there may be a strong genetic link. • Many patients that have been diagnosed with inflammatory bowel disease have had previous complications with their immune system. Because of this fact, it is believed that people that have issues with the immune system may be more prone to bowel problems. • In some cases, environmental conditions may be to blame for the gastrointestinal complications experienced by those with IBD. • Professionals have also established that bacterium that is typically known to cause diseases may result in the onset of inflammatory bowel disease. There are many different treatments for this gastrointestinal complication. Ultimately, the treatment that is used is based on several goals. The first is to relieve the uncomfortable symptoms that the patient is experiencing. The second goal is to reduce a number of digestive attacks that a sufferer experiences. Next, medical professionals will work to treat any and all complications that have stemmed from the condition that the patient suffers from. Examples of complications that may be experienced include infections, ulcers, and even nutritional deficiencies. Medications, medical procedures and even natural remedies may be used in the treatment of gastrointestinal problems. Furthermore, changes to the diet and lifestyle may also reduce the symptoms that are commonly associated with IBD. Examples of these changes may include reducing the amount of fiber that is consumed, avoiding caffeine, and avoiding substances such as alcohol. Furthermore, it is crucial for a sufferer to make certain that they are physically active and that they get the proper amount of rest each day. If these steps are followed, the symptoms associated with inflammatory bowel disease will be drastically reduced.